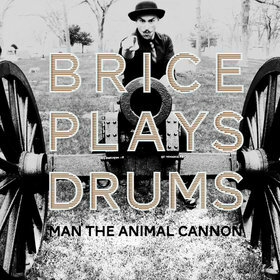 Brice plays drums formed in 2007 as a three-piece and have had various lineup changes. They blend styles of music including Jazz and Prog rock and certainly can't be considered mundane in their lyrical influences. They say they are inspired by novels from Nietzche, Dostoyevsky, Neil Gaiman, Alan Moore, Goethe, Albert Camus, to name a few - certainly not a typical list of influences you'll hear a band quoting. "Freight train blues" is quite a misleading title. I'd envisaged a real blues track, but the music here certainly wasn't what I'd expected. It's more of a Jazz track than a Blues one. The vocals are quite high pitched and are mixed way too low in the mix, so they just aren't prominent enough, and in my opinion just aren't strong enough. Brice Plays Drums have to be one of the most unusual bands I've come across - they really do sound like no other band I've heard. They're hard to put into a neat category, but experimental Jazz is probably the best description to give people an idea of a starting point for what they sound like. Musically they've got a really interesting sound, and it's really good stuff, but vocally I'm afraid I really don't think they do well. As stated previously the vocals are too low in the mix and aren't strong enough - they either need to remedy that or think about making it a purely instrumental group.